We posted before how soup shots are a great appetizer, but how about soup instead of salad as part of your however-many-course dinner? 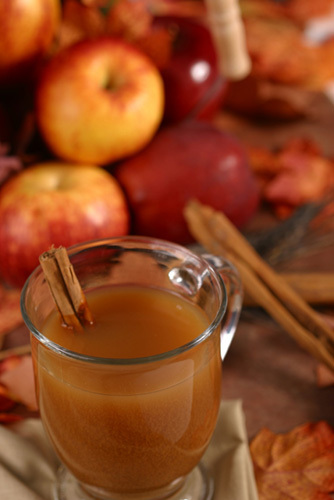 It's perfect for the crisp fall weather, and you can opt for a traditional type of soups (i.e. 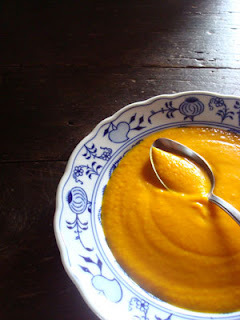 Italian wedding) or go for something more consistent with your theme (like butternut squash or pumpkin soup). Your guests will feel comfy and cozy in no time, and the pumpkin soup looks so yummy we want to bathe in it! Sticking with food, we've talked about how many brides are choosing cake alternatives for dessert on their big day. Our favorite non-cake dessert is definitely pie, which is perfect for the fall. 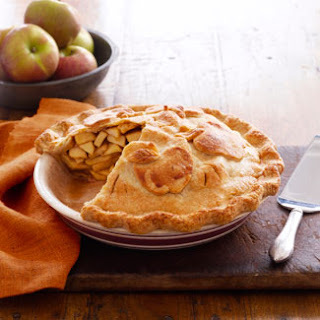 Hot apple pie and delicious pumpkin pie are fall staples that everyone loves, and are best served in the fall. So forgo the traditional wedding cake and opt instead for a pie table! Or, if you want a little bit of everything, then how about mini apple tarts and pumpkin pies? It's your wedding, so have fun with it. Your guests will definitely appreciate it. Instead of coffee with your dessert, try apple cider! It's delicious, goes with the theme, and looks too cute with the cinnamon sticks! Of course, you can always serve this during cocktail hour as well, to help keep your guests nice and cozy. 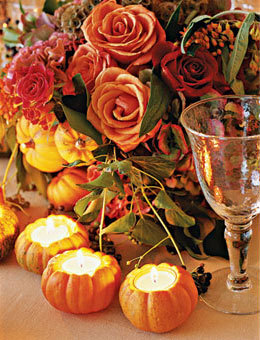 While fall wedding colors tend to be bold and vibrant, you can still have a seasonal theme minus the orange and red. Instead of pumpkins and applies, think harvests and crops. 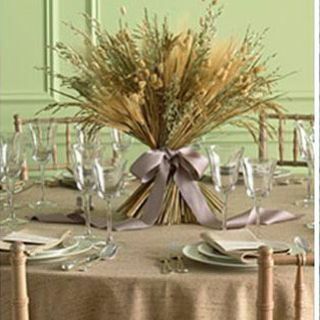 We love this wheat centerpiece, which is so delicate and beautiful, and provides a more muted palette for your fall wedding. 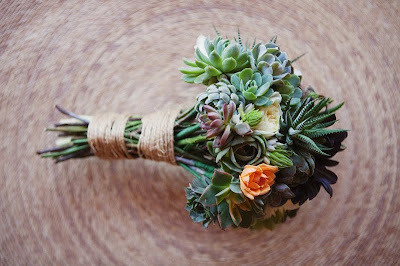 As for your bridal bouquet, try tying it with some twine rather than with ribbon. It will give a more rustic, country feel, and add charm to your wedding. The (slightly major) downside is that twine is so itchy and uncomfortable! Which means while it may look shabby chic, you'll definitely be ready to toss the bouquet at evening's end. While most brides usually don't carry around their bouquet all night anyway, this is definitely something to consider before adopting this look. While we do think pumpkins at fall weddings are very typical, be careful not to go too far. Keep it simple with these mini pumpkin candles that help create some ambience around your center piece. It's definitely better than having legit jack-on-lanterns at your wedding, but it adds to your theme and we think it's cute and quirky. We do think, however, that this look would look better with less bold colored flowers. Also, use it to decorate the gift table, the card table, or any other surfaces to pull your theme together. Another fall wedding staple are autumn leaves. Yes, we know it's fall which means leaves are falling, and it's very cute and all, but we're aware that too many fall looks can be overkill. 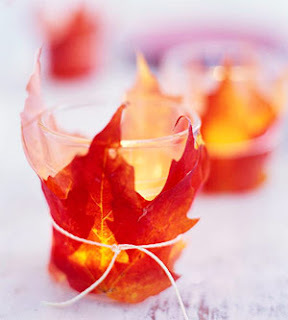 With that said, we think these tea lights wrapped in bright fall leaves are so beautiful and understated. It works great if your surfaces are light colored, as shown above, because it really makes the color pop without making it look cluttered. Here's to falling in love! Amazing creativity and design.. totally fantastic.. also the foods look delicious.. Your creativity is unlimited:)Your own world is open to you! Thanks a lot for sharing! I need to leave now... my marketing dissertation is not ready yet. Or, I will forward its assignment to​ http://dissertationwriting.services/ for a professional review. Please, do provide us with the Following information if you are interested.